I was recently referred a patient who started to complain of a purple spot in the vision of the right eye. The patient is 74 years old and had just received an injection of Botox and some dermal fillers for treatment of facial wrinkles. After the patient arrived at my office, a complete dilated eye exam was performed and I determined that my patient had developed a branch retinal artery occlusion (BRAO). There are two types of artery occlusions; central retinal artery occlusion (CRAO) which involves the entire retina and branch retinal artery occlusion (BRAO) which involves a portion of the retina. There are two general classes of retinal vascular occlusions. There are vascular occlusions (blockage of blood flow) of the retinal veins and vascular occlusions of the retinal arteries. Artery occlusions occur after a blood vessel is completely blocked by an object, called an embolus. An embolus is usually cholesterol, but can also be blood clots or fat. Retinal vein occlusions are not blocked by an embolus, but rather are squeezed close by an adjacent rigid blood vessel. In addition to my examination, a fluorescein angiogram was performed to help make the diagnosis. Both artery and venous occlusions have characteristic findings on the fluorescein angiogram. This is a picture of the retina of the right eye of my patient. The yellow arrow shows a bright white speck of cholesterol which is blocking a very tiny retinal artery. 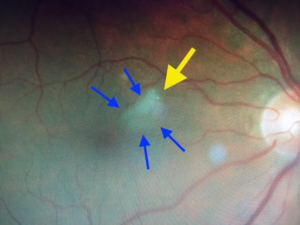 The blue arrows highlight the retinal edema, or swelling, caused by the blockage. Hollenhorst plaques are characteristic of artery occlusions and can be clearly seen to cause a blockage. A fluorescein angiogram is a diagnostic test requiring injection of a vegetable based dye into the bloodstream. 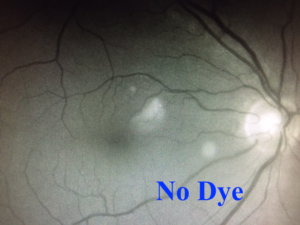 The dye travels to the retina and becomes visible when using a special filter. This is a great way to visualize blood flow. The two pictures nicely demonstrate “with” dye and “without.” The dye appears white and represents the blood flow. In most cases, the vision loss from artery occlusions is permanent. There can be complications that arise from the artery occlusions so follow up with a retina specialist remains important. The patient might have had a stroke had the plaque traveled to the brain. In cases of artery occlusions, it is important to assess the patient’s risk of developing a stroke. This requires team approach with the patient’s family doctor and possibly cardiologist. Occasionally, as a retina specialist in Orange County, I am consulted to care for a patient who has had complications from cataract surgery. This article talks about surgical complications of cataract surgery, that is, complications that can occur when surgery is not performed technically correct. Cataract surgery is one of the most common operations in the world as almost everyone develops a cataract. In almost all cases, after the cataract is removed from the eye, a plastic implant is inserted in place of your natural cloudy lens. The clear implant compensates for the focusing power of the eye and vision can be restored. The lens is not removed in one piece, but rather is removed by use of an ultrasonic tool which liquefies the lens. This is accomplished with a shaving motion – similar to scooping ice cream. Cataract surgery enjoys greater than 99% technical success. Over 99% of the time, your cataract was removed and replaced with a lens implant without complications. The most common surgical complications of cataract surgery occur when the cataract is not completely removed and becomes dislodged into the vitreous. The lens falls from its natural position straight down into the vitreous cavity (aka the back of the eye). This is called a retained lens. Loose zonules from trauma – the zonules are tiny filaments which keep the lens suspended in the correct position of the eye. Previous trauma to the eye can rupture these filaments, weakening the support needed for cataract surgery. There are natural conditions, too, which weaken the supporting zonules. Loose zonules from disease – this can occur naturally from such conditions as pseudoexfoliation, Homocytinuria and Marfan’s disease. There are other conditions where the zonules are either absent or weakened. A retina specialist is often needed to remove the remaining pieces of the lens from the eye. A vitrectomy is performed to allow the remaining lens fragments to be removed safely from the eye without causing damage to the retina. In most cases, there is little or no harm done to the retina. A vitrectomy is the basic operation performed by retina specialists. 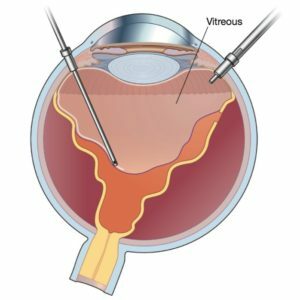 The first step to most retinal surgery is to perform a vitrectomy to remove the vitreous. 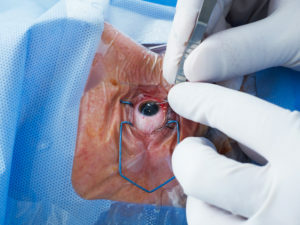 After the vitreous is removed, it becomes safer and easier to operate on the retina. The most common set up is called a 3-port vitrectomy. A port is simply a hole or entry port into the eye allowing us to insert instruments or tubing into the eye. The other two ports are used to insert instruments into the eye used by each hand. I use both 23 and 25 gauge systems when available. The gauge of the instruments refers to the thinness of the instruments. The higher the gauge, the thinner the instruments. Original vitrectomy instruments used the larger and thicker 20 gauge instruments which required sutures to close the incisions at the end of the case so the eye did not leak. There is a thinner 27 gauge system, but it is not widely available. As we no longer need to use sutures during our operations, the length of the operations has become shorter. Technology has improved the capabilities of the thinner instruments allowing us to perform the same surgical tasks as the original 20 gauge instruments. The biggest advantage of 23 and 25 gauge vitrectomy systems, however, is the benefit to my patients. Because there are no stitches, healing is much more comfortable, faster and often requires fewer post-operative office visits! Anti-VEGF injections are often used by retina specialists to treat a variety of retinal diseases. The injections are usually given safely in the office setting and do not hurt. VEGF stands for vascular endothelial growth factor. It is chemical, or molecule, discovered by cancer researchers in the 1980s. They found that tumors make this chemical to allow the formation and maintenance of new blood vessels (as a tumor enlarges, it must create its own blood supply). Amazingly, VEGF is also produced in the eye in cases of diabetic retinopathy and wet macular degeneration. In proliferative diabetic retinopathy, abnormal blood vessels grow inside the eye and can cause vitreous hemorrhage, retinal detachment or a specific form of glaucoma called neovascular glaucoma. This abnormal blood vessel growth is caused by VEGF! 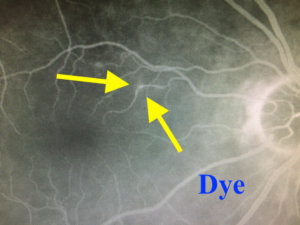 VEGF also causes normal retinal blood vessels to leak. How Do anti-VEGF Injections Work? Historically, there are 4 anti-VEGF medications used by retina specialists. All but Macugen, are presently used by retina specialists. Macugen may no longer be available in the Orange County area or other parts of the country. Anti-VEGF medications work by binding the VEGF molecules and blocking their ability to do damage to the retina. anti-VEGF medications are essentially antibodies directed against the VEGF molecule. The effects of a single injection may last for weeks or even longer. It is very difficult to deliver medications to the inside of the eye including the retina. Medications taken by mouth, eye drops and even intravenous medications do not get inside the eye very well. Direct injection into the eye is the best and most efficient way to treat disease of the retina such as macular degeneration, retinal vein occlusions and diabetic retinopathy. Injections are usually given as a series, that is, they must often be repeated depending upon the disease and the severity of your condition. Choroid – one of the deeper layers of the retina. Arthritis is a common type of inflammation limited to our joints. Inflammation is very difficult to conceptualize, but think of uveitis as arthritis of the eye. Posterior uveitis involves just the deep layer of the retina and is inflammation of the choroid. The most common symptoms of ocular inflammation include blurred vision, redness, sensitivity to light and pain. Depending upon the location, the symptoms can vary. For instance, there is usually less pain associated with intermediate and posterior forms. The iris and ciliary body are very sensitive. Inflammation here can cause significant pain and discomfort. In contrast, there are few nerve endings associated with the choroid, thus, inflammation of the choroid is generally painless. Uveitis can cause a variety of complications in the eye including damage and swelling of the cornea, cataracts, increased intraocular pressure, hypotony (low eye pressure) in chronic cases, retinal swelling or even retinal detachment. Most cases of uveitis are not too severe and do not cause many complications to the eye; however, complete dilated examination is important to be sure. There are dozens of associated systemic illnesses associated with uveitis. Most causes of uveitis are not associated with systemic disease. Viral, fungal and bacterial infections can cause uveitis, but the majority of cases the exact cause or association is not known. Trauma, such as fist or soccer ball to the eye, can cause iritis. Many patients experience recurrent episodes of the inflammation. Treatment of most cases of iritis involves steroids to reduce the amount of inflammation. 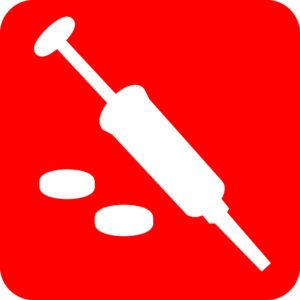 Steroids are most commonly given in the form of drops, but in more severe situations, steroid pills or injections are more effective. Anterior iritis usually responds well to topical drops whereas intermediate and posterior inflammation may require oral treatment or injections. 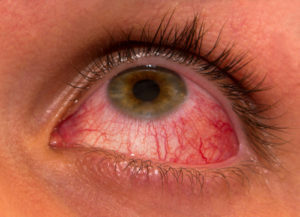 More severe cases of uveitis may require immuneosuppressive medications. A retina specialist often takes care of patients with uveitis.